This member of the Dasypogonaceae family was described by Robert Brown in 1826. It is found in Southern Australia, growing in rather heavy soil with some water and some to lots of sun. It is a slow grower; 1,5 centimetres a year, but will reach a height of six metres or more. 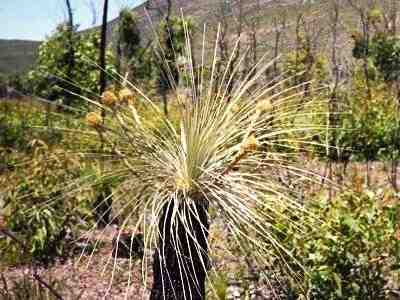 The flowers are yellowish, and a sure way to distinguish them from Xanthorrhoea, which occurs in same areas. Kingia and Xanthorrhoea are biologically quite distinct and are not closely related. For example, Xanthorrhoea has a secondary thickening meristem in the trunk (Dracaenoid secondary thickening meristem), whereas Kingia lack this feature.